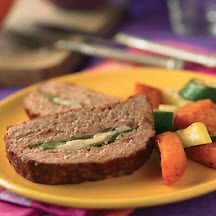 CooksRecipes has quality, kitchen-tested recipes for stuffed meatloaf that you can count on for successful deliciousness. Let's face it, nothing says comfort food more than a homemade meatloaf hot out of the oven—and this special meatloaf has presentation, as well! 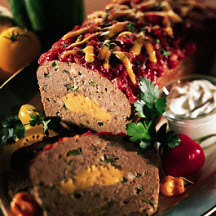 Finely crushed tortilla chips take the place of bread crumbs in this tasty Southwestern-seasoned meatloaf with a cheddar cheese center.